When looking at bench grinders and trying to figure out which is the best bench grinder for you there are a few basic things to consider. One is you have to think about what you are going to be using the bench grinder for. If you are mostly going to be using the bench grinder on wood, then you don’t need as powerful of one. If you are going to be using the bench grinder on metal or to make parts, on the other hand, you will need one with faster speeds. If you don’t know what you are going to be using your bench grinder for, then you might want to consider a variable speed bench grinder. The next thing to consider when looking at bench grinders is how big of wheels do you think you will be using on it. 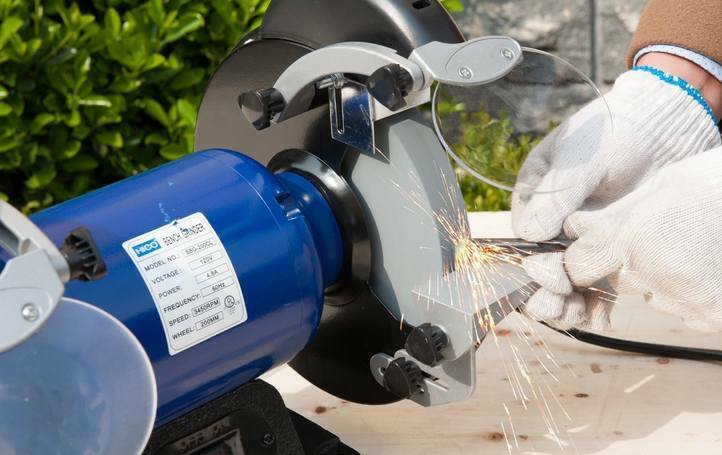 If you need to work on larger surfaces, then you will want a bench grinder that can support larger wheels. On the other hand, if you are going to be doing precision work, then you may not need a bench grinder with large wheels. The size of the bench grinder is also important when it comes to mounting. You don’t want to be looking at large bench grinders if you only have space for a smaller one. Bench grinders are a great tool and can be super helpful in any shop. 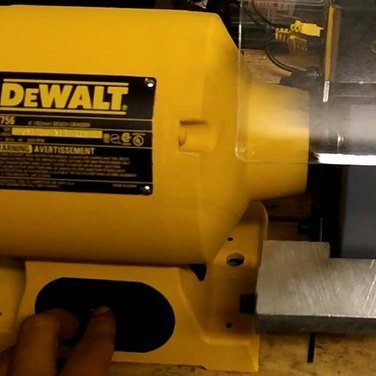 You can use your bench grinder to round edges, repair tools, and a whole lot of other things. Due to the fact that bench grinders can do so much, you should find the best one that will work for you and your needs. This list below will have a lot of great bench grinder options so you can make an informed decision on which one is right for you. 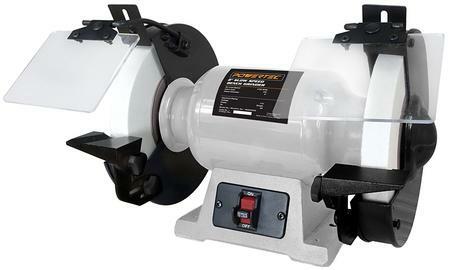 We have assembled 8 bench grinders that we believe will include the best bench grinder for you. They range in price, quality, and material so surely one will fit your needs. Some perks of this bench grinder are it comes with a 60-grit wheel as well as a 36-grit wheel. This means you can start buffing things or sharpening things right out of the box. Mentioning the box, though, some people have had issues with parts missing. This could just be that they got a return unit or something, but it is something to keep in mind. 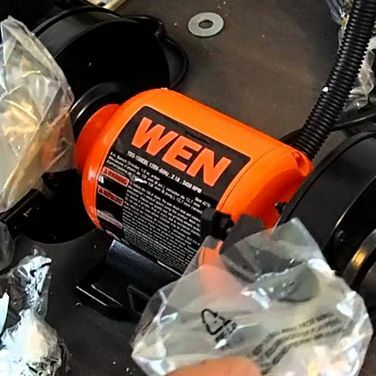 The Wen 6-inch Bench Grinder can also be a little tough to mount because you have to remove the wheels to get to the holes easily, but this is a small issue. The bench grinder only weighs 16 pounds, but still, has a durable cast iron base making it so it will stay put once mounted. 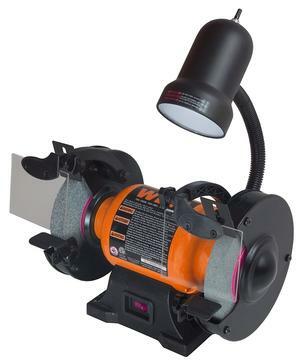 Another great thing about this bench grinder is it comes with a flexible light attached to it. This makes seeing what you are working on extremely easy. 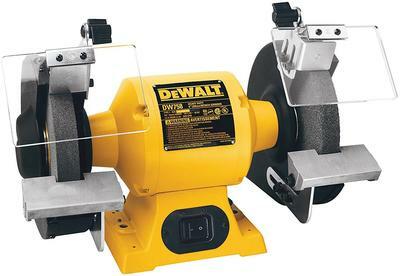 Another smaller 6-inch bench grinder is the DEWALT DW756. DEWALT makes great tools and this is another one that does the job well and is top quality for material. 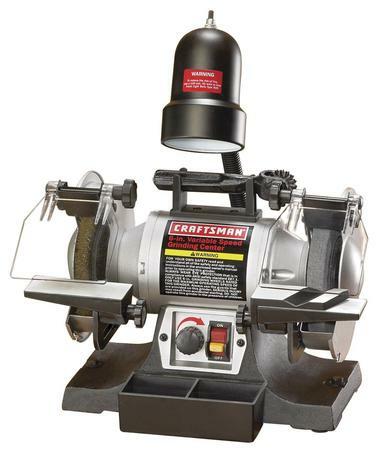 The bench grinder has a cast iron base that mounts easily to your work bench. The tool rest are made out of aluminum and allow you to get the right angle to sharpen things. This bench grinder is a little heavier at 26 pounds, but that is due to the top craftsmanship. The motor inside this bench grinder is five-eighths horsepower and this allows the wheels to spin at 3450 rpm. Due to the quick speed, you can use this grinder to remove material fast and also to remove harder material. Like the others, this one comes with a 36 grit wheel and a 60 grit wheel. One feature of this bench grinder though is it has rear exhaust in the wheel housings to help keep them cool. This bench grinder does have a few flaws, though. The wheels are about even with the motor housing which makes it hard to get the right angle for certain things. The wheels are spaced about a foot apart though which is a plus, but the housing can sometimes get in the way. 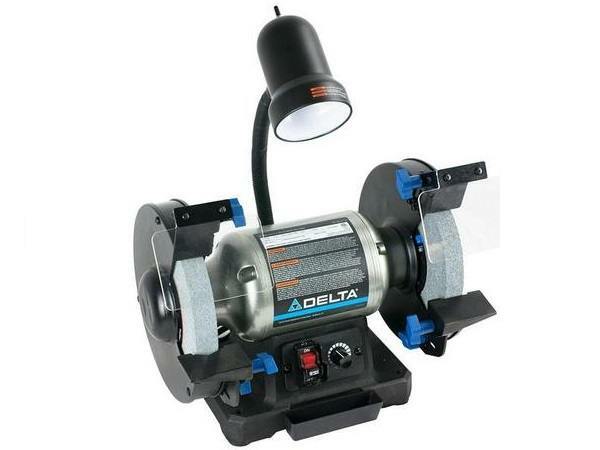 Getting to a little bigger bench grinder we have the Delta Power Tools 23-197 which is an 8-inch bench grinder that is also variable speed. The motor in this particular bench grinder is 5 amps and thanks to the variable speed control it can run from 2000 rpm to 3400 rpm. Variable speed is nice because you can work slower if you need to and not have to be precise with your touch which is really important for people that are new to working with bench grinders. Check latest prices here. Like most other bench grinders this one comes with the standard 36 grit and 60 grit wheels. Some unique things about this particular bench grinder though are it has drill bit rest premade into the tool rest so you can get the perfect tip on all your drill bits. Also, the tool rest are adjustable so you can compensate for wheel wear and get the perfect angle for all your grinding and sharpening needs. Another great thing about this bench grinder is it has a water tray. A water tray allows you a spot to dip the thing you are working on into it so it will cool off. Heat building up can be one of the most dangerous things of working with a bench grinder. This grinder mounts easily with its metal base and weighs around 20 pounds. One thing unique to this bench grinder compared to some of the other bench grinders we have seen on this list is it has rubber feet on the base. These are a nice added feature and really reduce the vibrating as you are using it. Also, the lights on this model are LEDs, so they are brighter than most of the other lights and last longer. 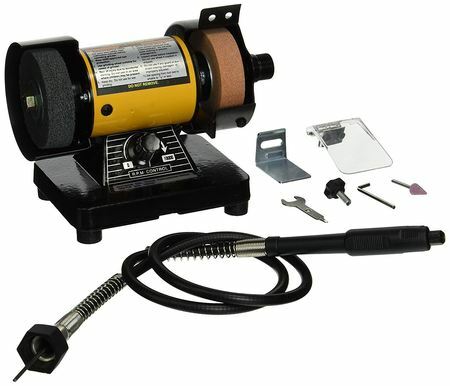 This grinder comes with the standard medium and course wheels, so it is ready to use right out of the box once it is mounted and the power switch is easily located on the front. Some people have complained that this grinder suffers from vibrating, but that is probably due to being mounted wrong because this bench grinder has an extra wide caste iron base to help with stability. This unit also weighs in at 33 pounds which are on the heavier side for a six-inch model, so I don’t think if mounted right it would vibrate. It also has an oversized tool rest to make it easy to work on large pieces of material. On top of that, the tool rest have spots for your drill bits to make getting the right tip easy. This is one of the other bench grinders that has a water dipping tray, so you can work longer on your tool without having to wait for it to cool. 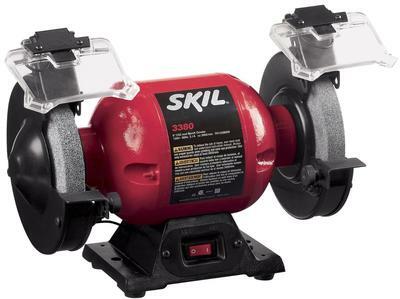 Like other models, it comes with the standard wheels, but this bench grinder also comes with a wheel dresser to help keep your wheels lasting longer. This is important because the wheels are the things doing the actual work and the motor is just what is spinning them. It still has a safety guard, tool rest, wheels, and the tools you need to change the wheels. The motor in this model is 150 watts that run off 110 volts at 60hz. This allows the wheels to spin from 0 to 10000 rpm. Since the wheels are smaller it is easier to get them spinning at a faster speed meaning you can remove material fast. Also, since the wheels are smaller it makes it easier to work on smaller things or areas that need precision. Some people complain that this model is too small, which makes it hard to work, but if you are using it for the smaller task it is great. If you need to buff or cut gemstones, then this is a good option. Also, any other small task would be really good on this grinder. If you try to do heavy duty work, though, then the wheels and motor will bog down. Other than that this is a great small bench grinder that is only 7 pounds. The wheels are made of white aluminum oxide, which produces less heat. This means that you can grind longer on harder metals than you could with other bench grinders from this list. This bench grinder is also high quality and made of heavy steel. This keeps it stable on the work surface once mounted as long as you mount it properly. The wheels that it comes with are great for the simple task such as sharpening mower blades or working on garden tools. If you are going to do heavy duty work, though, then you may want to consider another option. The motor on this bench grinder is comparable to the others and this one spins at around 3400 rpm like most of the other 6-inch bench grinders on this list. This list of bench grinders is a great starting point for figuring out which one is right for you. You really can’t go wrong with any of the bench grinders on this list. They will all do simple task extremely well, and some of them can be used for more advanced jobs. 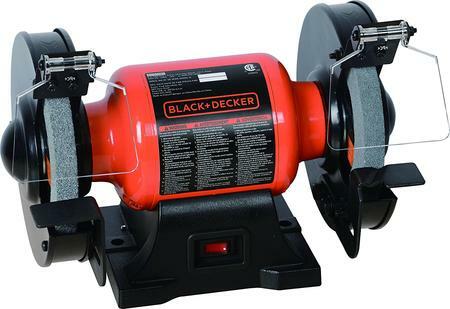 After reading this you should have a pretty good idea of what is the best bench grinder for you based on what you plan on using it for and your needs.